Forecasters are warning of more heavy snow in eastern Scotland as severe weather continues to cause problems across the country. More than 1,000 schools were closed and there was further disruption on the roads, railways and for flights. Edinburgh Airport reopened to outbound flights at 1600 GMT after being closed for the best part of three days. More than 200 passengers were stuck on a ScotRail train outside Perth for almost five hours. The train left Glasgow at 1542 GMT heading for Aberdeen but came to a halt near Forgandenny. Passenger Graham Menzies, 29, from Stirling, told the BBC Scotland news website: "A mechanic told me the brakes had seized and that it was minus 14 outside. "People were quite calm but there wasn't a huge amount of information being given out so people were irate. There was a three-week old baby near me and people were starting to get concerned so they started handing out free water and biscuits." Mr Menzies said ScotRail sent another train out which he believed was to attempt to pull the carriages but when that failed a replacement train was sent out which passengers transferred to. They finally began moving again just before 2130 GMT. "I was meant to be going to Aberdeen for the weekend but I think I'll have to try and get back home now instead," Mr Menzies added. A ScotRail spokesman said: "Every effort was made to resolve this incident as soon as possible. "The passengers were transferred to another train. We apologise for the disruption to their journey. "The weather is extremely daunting and given the ice and snow we would urge customers to check ScotRail's website before setting out and to allow more time for their journey." He said the fault was due to the loss of air pressure required to work the systems on the train, adding that this was connected to the freezing temperatures. Commuters across the country have been contending with treacherous conditions caused by snowfalls and black ice. Concerns were also voiced that petrol and diesel supplies could run out in rural areas of eastern Scotland by the weekend. BP said deliveries of petrol to stations from Grangemouth in Scotland had been "severely impacted" by the bad weather. The regulations dictating how long snow clearance drivers can be behind the wheel have been suspended due to the severe and prolonged weather conditions facing Scotland. First Minister Alex Salmond said: "By temporarily suspending time limits on driving time for gritters, we can ensure more roads are kept clear and give local authorities greater flexibility to deal with these difficult conditions and keep Scotland moving." He told the Scottish Parliament that Scotland had two months' supply of grit, even with heavy use. About 250,000 Scottish pupils had the day off on Thursday, but some councils - including Glasgow - were able to re-open schools. Education Secretary Mike Russell has told education bosses to decide as early as possible if they are going to shut down all schools in their area because of wintry weather. His comments followed parental criticism of Glasgow City Council, which issued a blanket closure announcement less than an hour before the school bell on Wednesday. Mr Russell, who contacted local education directors overnight, said blanket decisions should be an absolute last resort, and head teachers were best placed to decide whether pupils should stay at home. Mr Russell said late decisions could cause "absolute chaos". He added: "It is quite clear people have very major commitments - and when it happens at a time when children are already on their way to school, that actually can be more dangerous. So there needs to be a very early decision." Some school pupils have already had three days off classes this week. Midlothian Council said its 37 schools would be shut for the rest of the week due to the weather. All state schools in West Lothian, East Lothian and Scottish Borders will also be closed until Monday. All schools in Falkirk and the Dundee area were closed on Thursday. Meanwhile, the east of the country was experiencing the worst of the snowfall, with police in Tayside urging motorists not to drive unless it was vital. In central Scotland, the A9 was closed northbound at the Little Chef, Balhaldie, after a lorry jack-knifed. On Thursday morning, all major road routes in the west were open and Glasgow and Prestwick Airports were functioning normally. However, a jack-knifed lorry near Bothwell Services on the M74 caused tailbacks and in Lanarkshire black ice was making conditions dangerous on the A73. Have you taken pictures of snow covered Scotland? In Ayrshire, side roads in Kilmarnock were badly affected. Temperatures overnight fell to -21C in Altnaharra in the Scottish Highlands. Across most other cities and towns the temperature fell to nearer -6C. In the north-east of Scotland, the weather was causing problems on roads for a ninth day. An RAF rescue helicopter from Lossiemouth was called in to airlift a man from the Turriff area to Aberdeen Royal Infirmary. Heavy snow in parts of Aberdeenshire, Tayside, Lothians and Borders were again making travel conditions extremely hazardous. 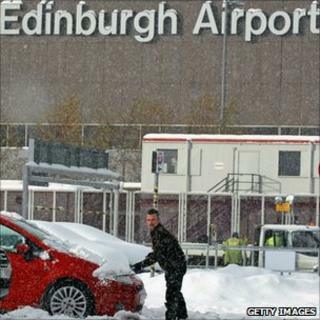 Edinburgh Airport reopened on Thursday at 1600 GMT for outbound flights only. The airport said it hoped to take incoming flights from 1800 GMT. Dundee Airport said it was up and running after closing on Wednesday. Train passengers also faced delays and cancellations. The East Coast mainline service was cancelled north of Edinburgh.